And so, the spring/summer of short, fast races begins! I kicked it off with my first ever 8K (unusual distance, right?). Since this was my first short race since last summer and my pace has improved dramatically since then, I wasn't sure what to expect, so I went out a little conservatively. Looking back, I'm thinking I went a little too conservatively because I definitely had a ton of gas left in the tank at the finish line. D even said I didn't look tired or sweaty. Oops. Next time, right? This course is pretty fantastic, mostly flat and/or downhill with a few small hills on the back half. Side note: what is up with Charlotte and hills on the back half of the course? But really, the course is beautiful. It winds through the tree-lined, residential streets of the Elizabeth neighborhood in Charlotte and it's nice and shaded with a good amount of crowd support (thank you, Elizabeth residents!). Oh, and Elvis was there. The start was a little disorganized, but nothing that should deter anyone from running this race. They also did a touching tribute to the Boston Marathon tragedy and some Charlotte residents who were injured there, and gave participants blue honor ribbons to wear during the race. I was pretty happy with how I raced and was even more happy to see those sub-8 minute miles and negative splits (see below)! My final time was 40:04 at a pace of 8:03. Sadly, I was edged out of placing in my division by about 40 seconds and I missed my time goal by five seconds, but like I said, it was my first 8K, so I played it conservatively in the first mile and now I have a baseline for next time. Overall, I couldn't have asked for nicer weather or a better run (D even joined the fun by running in the 1.5 mile fun run). 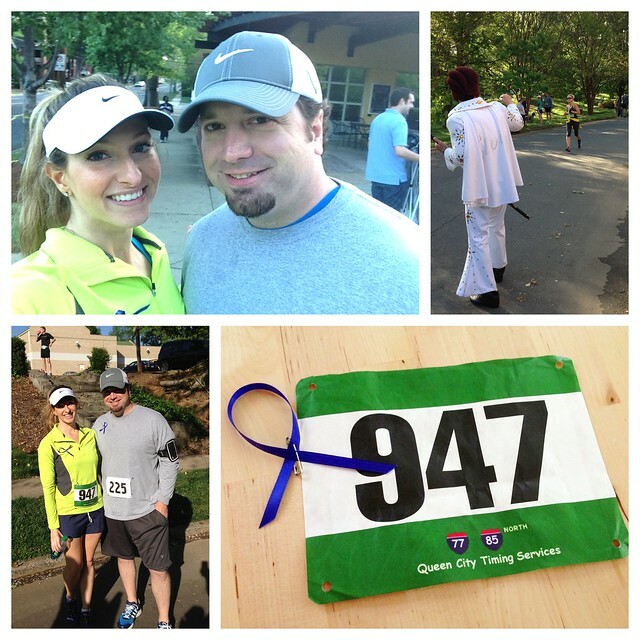 This race was excellent way to kick off the Summer of 5Ks (and 10Ks and one 8K). Up next: the CPCC Skyline 5K this coming Saturday. Bring on those sub-8 minute miles.